Wrigley Field is better aligned for shadows than many of its younger ballpark peers (via Jeramey Jannene). So you decide to visit a new ballpark for a Sunday afternoon game. Where do you sit? For me, it’s pretty simple. I like to be as close to the field as possible. By possible, I mean financially within reach. However, my wife prefers sitting in the shade. So, there are the mathematical outlines of the problem – get as close to the field as we can within the constraint of sitting in the shadows. Here’s a short experiment to see how shadows work. Hold a bat vertically with one end on the ground. The shadow will be exactly opposite to the direction of the sun. So too is the shade in the ballpark created by the shadow of the stadium. If you leave the bat in that position throughout a midsummer day, you’ll notice the shadow is the shortest and points northward at around noon. As the afternoon goes on, the shadow grows and swings around toward the east. By sunset, the shadow is as long as it can get and is pointing toward the southeast as the sun sets in the northwest. So, the location of the shady seats depends upon the orientation of the field and the time of day. It is desirable that the line from home base through the pitchers plate to second base shall run East-Northeast. Let’s see how well the 30 ballparks meet this requirement. Using data from Google maps, the figure at the right shows arrows in the direction of the line that joins home and second base for each of the current major league parks. In the diagram, up the page is northward so east is to the right. Notice that the east-northeast direction of Rule 1.04 is indicated with the green arrow. The red arrows are either indoor parks or parks that can be covered. Clearly, Rule 1.04 is the second-most ignored rule in baseball. You know the first – the shortstop touching the second base bag on the front end of a double play. So, what is the purpose of Rule 1.04? In the summer, the midday sun is in the southern sky and moving toward the west. So, for a game that begins at 1 p.m. and ends about 4 p.m., the sun starts just west of south and moves so that it will eventually set in the northwest. Therefore, a properly aligned ballpark will be oriented northeast-ward to keep the sun out of the batters’ eyes during the game. As a result, the sun is often in the eyes of the outfielders. Incidentally, for a properly aligned ballpark, right field will be last to be engulfed in shadow. This explains why right field is sometimes called the sun field and is one reason you generally put your best defensive outfielder there. Since we’re off topic, picture a lefty on the mound of a properly aligned field. His throwing arm will be coming at the batter predominantly from the south. Legend has it, this is the origin of the term “southpaw.” Finally, the old wooden outfield benches were in full sun throughout the day causing the wood to fade and crack. Hence, they are the “bleachers.” Now, where were we? Oh yeah – ballpark orientation. 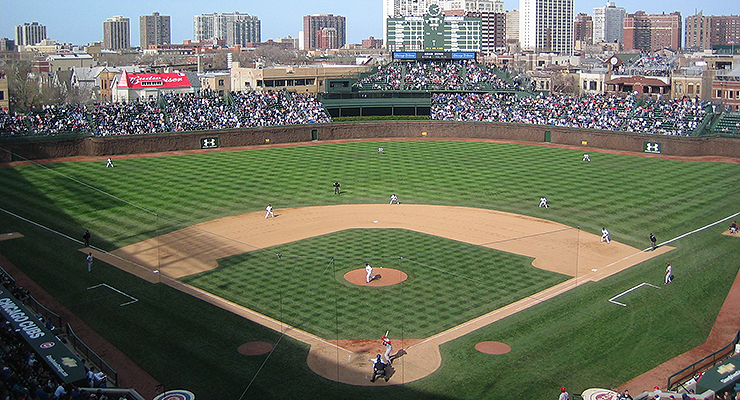 Wrigley Field and Fenway Park were both built before lights, so they were oriented when only day games were played. Yes, children, very long games were once called on account of darkness. 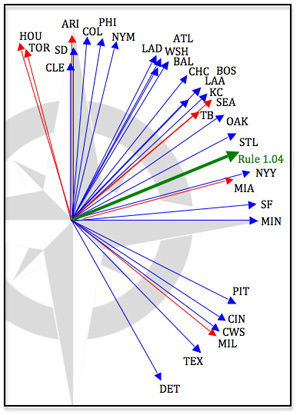 You’ll see that both Fenway and Wrigley are oriented toward the northeast but further north than required by Rule 1.04. This may be due to the fact that both parks are at more northern latitudes, meaning the sun is further southward in the noontime sky. I used data from FindMyShadow.com to generate the figure at the left, which shows the direction of the shadows at Wrigley from 1 p.m. to 4 p.m. in midsummer. At game time, the sun is shining directly toward center field. As the game progress, the sun moves northwest, reaching due west by 4 p.m. 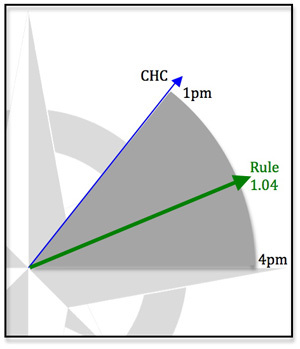 Note that the shadows swing past the Rule 1.04 direction about mid-game. So, why are the orientations of stadiums so disparate? Well, certainly the preponderance of night games makes Rule 1.04 less important. Therefore, other considerations come into play. For example, four of the six parks that are oriented southward are known to be toward the top of the list of windiest ballparks (Chicago, Detroit, Milwaukee and Texas). Their orientation may have been designed to minimize the effect of the prevailing winds. Many people falsely believe that AT&T Park in San Francisco was designed with a short right field to help Barry Bonds reach the home run record. The original design was for a more symmetric park oriented more toward the northeast. However, wind studies showed it would be worse than the notorious ballpark it was to replace – Candlestick – where fans had to endure arctic gales and every popup was an adventure. Even with the short porch in right, AT&T is perennially ranked at the bottom for home runs, with this year being no different. Certainly, the local geography of a site can influence the direction of the park. You might think the parking lot stadiums such as Kansas City, Los Angeles, Oakland, Philadelphia and Texas would have no excuse but to follow the rule. However, their orientations are nearly as varied as the other ballparks. Dodger Stadium had to be nestled into a hillside in Chavez Ravine. How else could you have built five decks back in the ’50s? Another factor that might become more important than the occasional shadow is aesthetics. For example the fabulous cityscape views in Pittsburgh and St. Louis might have taken precedence. I’ve now been in my study pounding my laptop keys for far longer than it takes to order tickets. My wife is getting suspicious that I might be visiting inappropriate websites. So now that I’ve figured out where the shady seats are, I best hustle up and place an order. See ya at the yard. Comiskey Park was oriented with home plate at the corner of 35th street and Shields avenue, pointing Northeast. When they tore it down and built US Cellular field on the other side of 35th street, they still wanted home plate at 35th and Shields, so the ballpark now points Southeast. I think the new Tiger Stadium was built right across the street from the old, maybe it points southeast for the same reason. Not sure about the other southeast pointing ball parks. Comerica is about a couple miles from the old Tiger Stadium site. It’s orientation was also probably determined to give a good view of the skyline. I’ve always wondered why The Cell is oriented the way it is. Seems like it would have been more dramatic to face home plate to the north, so the cityscape would be beyond the outfield wall. But this solves the riddle! Thanks, MikeS. I remember someone analyzed home-field advantage and determined that a disproportionate amount came from excess runs scored in the first inning. I wonder if games that begin in twilight might put the visiting team at a disadvantage in terms of tracking fly balls or even pitches (as shadows from behind home plate towards the pitchers mound). I had no idea that there was such a difference in ballparks’ orientation. In some stadiums, lefty pitchers chould be called “eastpaws”. Interesting article, but centerfield, not right field, is where you usually put your best defensive outfielder. Right field is where you often put your best arm. Also, it’s interesting to note that YS is most closely aligned with the rule, but left field has always been the sun field. The old YS was oriented differently from the new one, also for Babe Ruth, the story goes. He had a short porch to clear in right, which meant less ground to cover in right, and afternoon shade in right. Sweet gig if you can get it, and if you’re the biggest icon in the sport. Your etymology of the word “bleachers” is wrong. They not only resembled, but often actually were, the ‘bleaching boards’ used by cod fishermen in New England to cure fish. Nineteenth century Americans were quite familiar with this industry and its trappings. It was the cod fish that were bleached, not the boards themselves. Do you mean the neighborhood play as the #1 most ignored rule in baseball, David? If you do your right! Rule 1.04 says it is ‘desirable’ which hardly makes it a rule. You did get one thing wrong. Most baseball games (Arizona, for example, excepted) are played during Daylight Savings Time. So shadows are shortest not at or near noon, but 1:00 PM. You’re therefore off by an hour in your explanations. It also looked like FindMyShadow does not account for DST. It was a fairly crazy couple days and I was so glad I got to share some part of it. 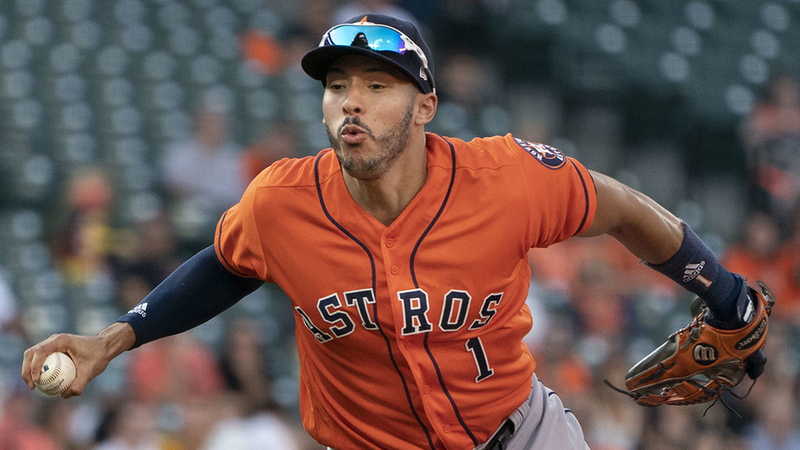 Organized baseball, best outfielder – center field, best arm – right field. Sandlot baseball, worst player – right field, smallest player – second base and usually leadoff hitter. Good luck if the worst player was also the shortest player. tch. tch. Few people in fashion are capable of envisioning a great spectacle in the way that he does for his over-the-top presentations, and they’re consistently a pleasure to watch, whether or not you enjoy the clothes.